This past weekend, I was given the opportunity to lead worship for several hundred teenagers at the Teenage Christian Conference in Albuquerque, NM. First off, leading worship for teenagers is just about the best experience one can have, IMO. Teens are uninhibited, and on fire for the Lord. We have much to learn from them, as all weekend, they praised with their entire heart and soul. And, when you consider that we were without A/C for part of the weekend (hence the fan next to me in the picture), worshipping with conviction did not come without challenges. Leading worship for Jeff Walling is always a treat, and he and I got to spend some time together catching up. Jeff has a powerful way of speaking God’s word. He can have the room rocking with laughter, and then, within seconds, have the entire group in tears with the way our lives need to change. Jeff interviewed me during one of the sessions in order to teach how we should see Jesus when we see people who look different than we do. God used Jeff this weekend to bring many back into a relationship with God, and several teens were baptised as well. Joni and I also got to meet Rusty Tugman from Norman, OK. Rusty concluded our weekend with 2 very powerful messages with calls to evangelise. Rusty and I hit it off very well, and we found out that he and his family will be in Walt Disney World at the same time as Joni, Hannah and I will be. We already have plans to meet up so that we can meet the rest of his family and share some time together. Lance and Tim at the Montgomery Church of Christ in Albuquerque, NM are to be praised for their hard work in setting up and running this wonderful weekend. Lance’s passion for teens could really be seen this weekend as he poured himself out for these kids. 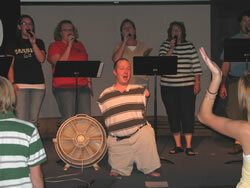 I really enjoyed working with Montgomery’s praise team, and they were a joy to get to know as well. This weekend was an absolute joy…well…except for the looooong car ride. Oh well, if you ask me, the car ride, lack of A/C, and constantly being on the go this weekend were all worth it to see those teens praise, and to witness 10+ teens put on Christ in baptism. I pray that the Lord continue to use TCC in a powerful way!